You are currently browsing articles tagged navicular. Is your farrier or hoof trimmer doing a good job? 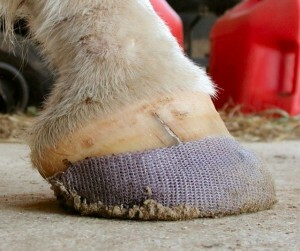 Does your horse have hoof health issues that have gone unrecognized? These books provide the information you need to become an educated consumer of hoof care, to begin learning to perform a basic hoof trim, and beyond. Can Equicast Help your Horse? Equicast is a powerful tool for rehabilitating horses with damaged feet – increasing your horse’s comfort while improving his hoof form and function and helping him to heal. Equicast is used to eliminate quarter cracks. Equicast is an open-weave knit bandage soaked with plastic resin that hardens on contact with water, similar to the material used to create Fiberglas casts for broken bones. It is used with adhesives, padding, and reconstructive resins to create custom-molded therapeutic hoof boots that stay put, breathe, and don’t bruise or rub.